The football version of the patented Tempt Destiny game is played with one or more players while watching or listening to a collegiate or professional football game. You can play it at home, at a sports bar, or even at the football stadium! No extensive knowledge of the sport is required to play  just the desire to have fun! 1. 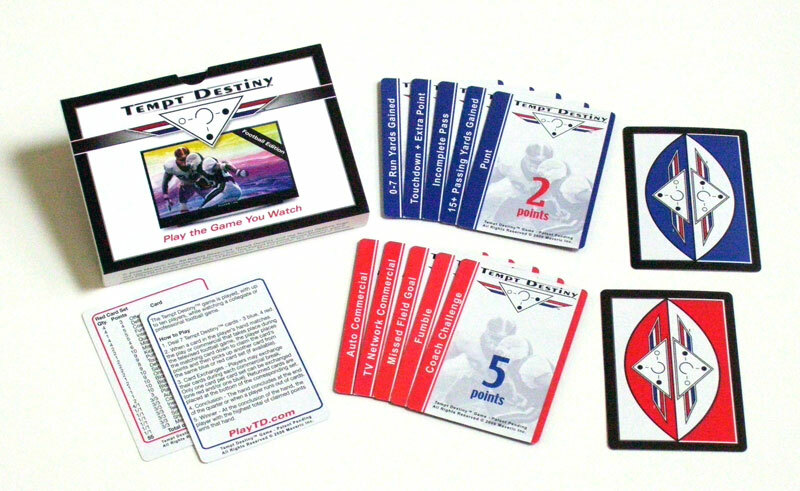 Distribute 14 cards - 6 blue Tempt Destiny cards, 8 red Tempt Destiny cards. NOTE: For more player activity we suggest increasing the cards distributed. For example: 2 players (12 blue - 15 red), 3 players (10 blue - 12 red), 4-5 players (8 blue - 10 red). Although you may run out of blue cards to pick from, you will definitely increase your interactive experience. 2. When a card in the player’s hand matches the play or commercial that takes place during the football game, the player places the matching card down to claim the card’s points and then picks up another card from the same blue or red card set (if available). 3. Card Exchanges - Players may exchange their cards during each commercial break. Only one card per card set can be exchanged (one blue and/or one red). Returned cards are placed at the bottom of the corresponding deck. 4. Conclusion - The hand ends at the conclusion of the quarter or when a player runs out of cards. 5. Winner - At the conclusion of the hand, the player with the highest total of claimed points wins the hand. 1. Card Check - Player must show the matching card being claimed to the other players for approval or be penalized to return all of their claimed cards to the deck. 2. Player can only claim one matching card per play or commercial break. 3. Player must claim the matching card prior to the next play or lose the opportunity to claim points for that play. 4. Penalty cards overrule all other cards except when the penalty is declined or is added to the end of play. 5. Touchdown + Extra Point card does not apply to touchdowns made during Kickoff Returns, Punt Returns, or by the Defense. 6. Tie-Breaker - If two or more players have the same total of points claimed at the conclusion of the hand, then the player having the highest total of points in their hand, wins. If a tie still remains, flip a coin to determine winner. *Run Yards Gained includes runs and handoffs by the quarterback and does not apply to punt and kickoff returns, or yards gained after pass reception. **Passing Yards Gained includes running yards after pass reception (receiving yards). Note: Player Time Out cards are for Tempt Destiny players to claim points at anytime while taking a break, getting refreshments, etc.